Did you forget that Christy has a daughter named Violet? For a while it seemed like the show might have, but it turns out it has not. In the latest episode of Mom, Violet returns, and she has a lot to say about Christy from when she was drinking. S6E8 "Jell-O Shots and the Truth About Santa"
The episode begins with Christy's usual complaints about her mom, but when a classmate refers her to a podcast where someone complains about their mom, that someone turns out to be Violet. Christy can't believe that Violet would talk about how bad of a mother she was when she was drunk to everyone, and eventually calls Violet from Bonnie's phone. Christy's awkwardness while leaving a voicemail is funny, but it also really shows how Christy and Violet don't talk. After Violet responds by playing the voicemail on her podcast, Christy decides to go to Violet. After some initial angst from Violet that comes off as over-the-top (such as when Violet takes offense to Christy asking about Luke, assuming she thinks she couldn't get this apartment on her own), the mother and daughter get serious. Talking face-to-face, Christy and Violet are really able to tell the other how they feel. Violet recognizes how Christy has changed, but reminds her, and especially us in the audience, as we've only ever heard about Christy's drinking days, what life was like when Christy drank. There's an understanding between the two, but the show doesn't use this to take the expected route. Instead of having them reconcile and decide to work together to repair their relationship, Violet tells Christy that, right now, she doesn't want them to have a relationship. In doing this, the show recognizes how complicated this relationship is, and it also gives good reason for the fact that Violet is going to continue to not be on the show. But the moment in the hall between Christy and Bonnie after this is a reminder that this is just for now, and gives the show the chance to re-introduce Violet at some point down the line (probably a couple of years from now, I would guess). Compared against this nuance and ending that certainly isn't typical, the subplot about Adam and his bar feels out of place. Mom frequently does episodes with just one story, and this would be an episode where it would make sense to do that. Instead, we also get a forgettable story where Adam worries about how his bar will perform once it is opened. It's not that this story is that bad, it just lacks substance, and feels generic. Most of all, it just seems unnecessary. The main story of this episode felt grounded and overdue. 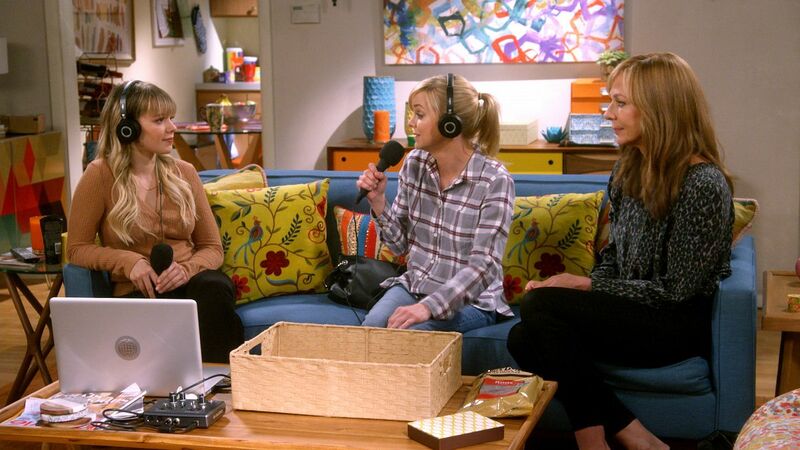 Mom can be a really funny show, but the part of this episode that worked best was when they didn't go for any jokes. Sadly, the subplot didn't even come close to the quality of the main one. Still, this was a strong episode. What did you think of "Jell-O Shots and the Truth About Santa"? Leave your thoughts in the comments!